The Ivory Coast international is expected to be a player in demand in the summer after an impressive campaign. 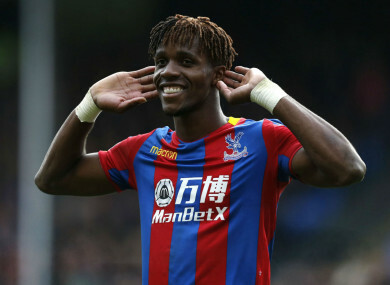 WILFRIED ZAHA HAS been valued at £70 million by former Crystal Palace chairman Simon Jordan. Zaha has been in sparkling form this season, scoring eight goals as Palace avoided relegation under manager Roy Hodgson. The Ivorian picked up the Player of the Month award for April as he scored four and assisted once, helping the club on their way to an unbeaten month. The forward is unlikely to be short of suitors when the transfer window opens but they will have to pay a hefty sum to prise him away from Selhurst Park, according to Jordan. “I think Wilfried Zaha is a £50 million to £70 million player in this market place,” Jordan told Talksport. “Given the inflated market place, given his age, given the fact he’s performed at such a level in a side this season which hasn’t been great. If you put him in a side that has some real balance and poise about it, you’d only get more from him. Tottenham, Chelsea, Man City and Liverpool have all reportedly been keeping tabs on Palace’s star man but Jordan does not believe that they will cash in on him yet. Email “'Wilfried Zaha is a £50 million to £70 million player'”. Feedback on “'Wilfried Zaha is a £50 million to £70 million player'”.